It was a day of opportunities for local market vendors at the United Nations Development Programme’s (UNDP) Business Fair at the Lautoka Municipal Market yesterday. It was held to bring together financial, agricultural and social service providers to the markets to provide information, creating awareness and deliver services to the market vendors. Emali Koronawa, 48, who has been a market vendor for the last three years said the fair was vital to her in terms of securing her finance. “For us as market vendors, we just cannot leave our stalls anyhow and then spend half an hour in the banks or the insurance companies,” said Ms Koronawa. UNDP in partnership with local Governments, regional banks and the Ministry of Agriculture as part of the United Nations (UN) Markets for Change Project organised the fair. 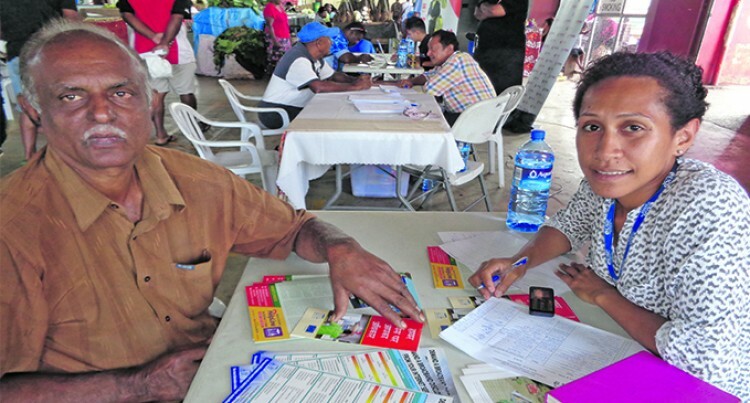 “I was able to get access to my Fiji National Provident Fund account and insurance at this fair,” stated Ms Koronawa. “I’m really happy for that,” she added. Ms Koronawa said she was glad that the fair enabled her to secure her life with the insurance company. Catherine Heritage, Market for Change Project Assistant, said that this was a great platform for all the market vendors to get access to a range of services and information. Ms Heritage said that some of the market vendors did not even have a bank accounts because they did have enough time to go to banks. UNDP tried to make the services accessible and conveniently available to them. Institutions like the Consumer Council of Fiji, Fiji National Provident Fund, banks, micro-financing companies, Life Insurance Corporation of India (LICI) and Bio-Security Authority of Fiji were present at the fair. Similar market fairs will be held in August at Labasa and Savusavu. Ms Koronawa said that it was time for women to take up the big roles in their lives. “As a woman myself, I do not have to go around in search for money if I need it—Now I’m earning it for myself,” said Ms Koronawa. Ms Koronawa said that now she was the equal contributor to her family with her husband. “Now I pay for the electricity bill and if it’s not paid, I take the full responsibility,” she said. Ms Koronawa said that times were changing and the general notion of women doing only domestic work was also fading away. “Women are now equal contributors towards the growth of a nation,” she said. “As a woman, most of the time we tend to rely on our husband,” she stated. “But women need to stand up and just be themselves. “Whenever I see a woman sitting down and crying, I always ask her why she was crying. Ms Koronawa said that challenges such as natural disasters and lack of stock to be re-sold at the market stalls had really affected her. “Sometimes our stock is really low and we have to run to Ba or Nadi or even to Rakiraki to get out stock,” said Ms Koronawa. “Sometimes our business is really low,” she said. She also said that natural disasters affected the sector badly.